The PMP Credential just like other credentials that the Project Management Institute www.pmi.org administers has a Timeline attached to it. 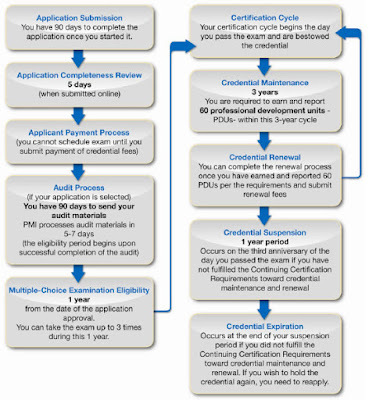 Below is the PMP Credential Timeline explained. By now you must have heard that the PMP Exams will be changing and here is why? Every five to seven years, the Project Management Institute (PMI)® performs a Role Delineation Study(Job Analysis) to determine authority (“the role”), responsibilities & duties of project managers today. The findings are then used to update the Project Management Professional (PMP)® Exam. In this way, PMI ensures that the PMP Exam is a reflection of what project managers actually do in the field. If PMI didn’t regularly go through this process adding new elements and removing old ones, then you would still be tested on outdated methods that were used in the 1980s when the first PMP exam was given. PMI completed their latest study at the end of 2010. The findings will lead to an update in the PMP Exam on 31 August 2011. . As a result, approximately 30% of the PMP exam will change. A survey carried out by the National Association of Colleges and Employers Job Outlook 2007, employers rated communication skills, and honesty and integrity equally at the top of their list of what they look for in potential employees. Following closely behind communication, and honesty and integrity were: interpersonal skills, motivation/initiative, and strong work ethic and teamwork skills. One thing I know about those skills was that all of them are inherent in project management, and it emphasized what people believed for years: Project Management is a career accelerator.